Faber-Castell's Pitt Pastel Pencils are very suitable for lines, shading, and delicate color transitions, and also for extended areas. Use them for sketches, studies, portraits, still-lifes, and landscape drawings. They give a smooth flow of color without being used up too rapidly. Colors are rich in pigment, allowing dense shading. They do not change on fixing or exposure to light. 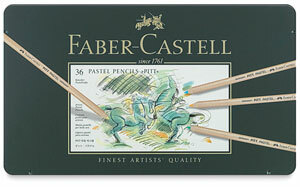 Wood-cased Pitt Pastel Pencils do not dirty the fingers, and the leads are free of oils. They can easily be wiped to merge areas of colors, which means that they must then be fixed to protect the drawing. Pencils are pre-sharpened. Individual lightfastness ratings are printed on each pencil's casing. Faber-Castell pencils are made using environmentally safe, high-quality materials and low-pollution processes. The company uses only wood from its own reforestation and soil conservation project in Brazil to manufacture pencils. Faber-Castell grows its own trees on land that was once denuded and deforested, subject to soil erosion. The company even recycles the waste products from manufacturing pencils to increase the fertility of the soil. Faber-Castell's Pitt Pastel Pencils are very suitable for lines, shading, and delicate color transitions, and also for extended areas. Use them for sketches, studies, portraits, still-lifes, and landscape drawings. They give a smooth flow of color without being used up too rapidly. Colors are lightfast and rich in pigment, allowing dense shading.